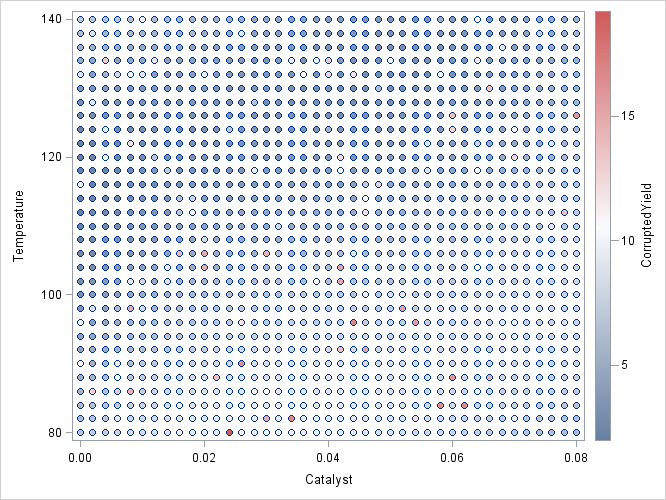 The following data set records the results of an experiment to determine how the yield of a chemical reaction varies with temperature and amount of a catalyst used. The aim of this example is to show how you can use PROC LOESS for robust fitting in the presence of outliers. 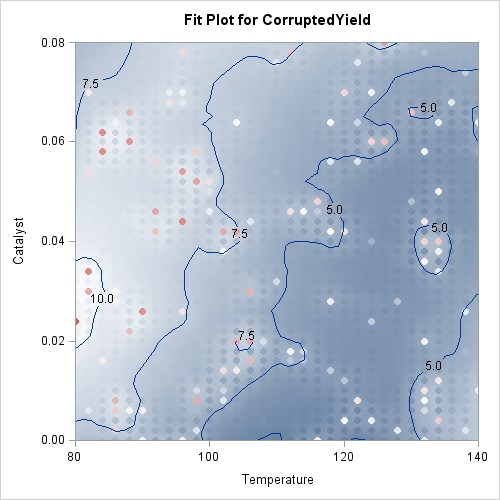 To simulate an intermittent equipment malfunction, the variable CorruptedYield is the same as the variable MeasuredYield except for about 10% of the observations where an offset has been added. 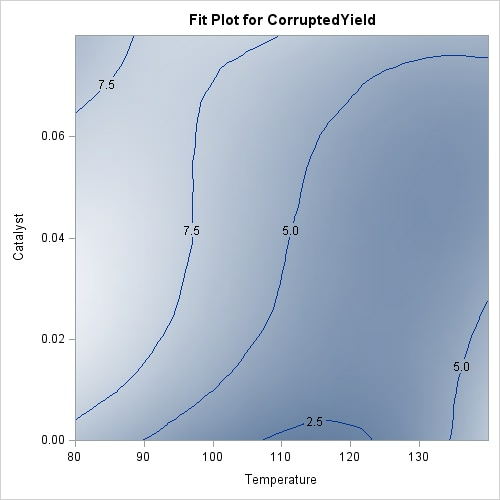 This example shows how you can use PROC LOESS obtain a fit for CorruptedYield that is close to the fit you obtain for MeasuredYield. 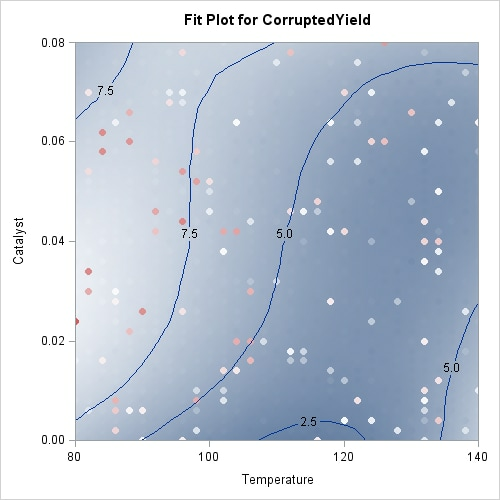 Output 53.3.1 shows a scatter plot of the data where the observations are shaded by the value of CorruptedYield. The darkly shaded points that are surrounded by lightly shaded points are points where the simulated incorrect measurements occur. The SCALE=SD(0.1) option in the MODEL statement specifies that the independent variables in the model are to be divided by their respective 10% trimmed standard deviations before the fitted model is computed. This is appropriate because the independent variables Temperature and Catalyst are not similarly scaled. The “Scale Details” table in Output 53.3.2 displays the details of ranges of the regressors and the scale factors applied to each regressor. Output 53.3.3 displays the loess fit. 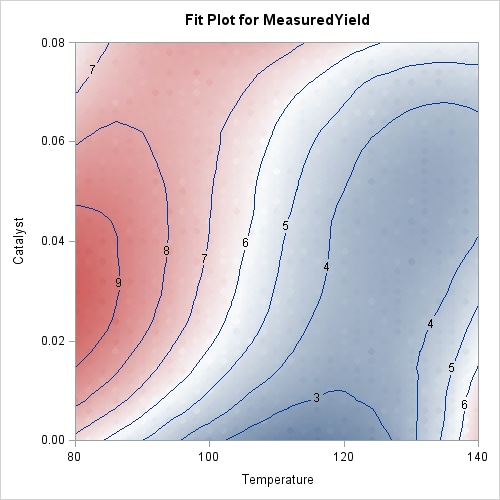 Because the fitted surface is a good fit of the observed data, the observations on this plot are not clearly distinguishable from the fitted surface. The results are dramatically different when the outliers are included. The following statements fit a loess model to the corrupted response, using the same smoothing parameter that was selected for the measured response. The ITERATIONS=4 option in the MODEL statement requests the initial loess fit followed by three iteratively reweighted iterations. Output 53.3.6 shows the robust fit with the observations suppressed. The range of the fitted surface values in this plot is similar to the range in Output 53.3.3. By comparing this contour plot with the contour plot in Output 53.3.3, you clearly see that the robust loess fit has successfully modeled the underlying surface despite the presence of the outliers.